Sharply marginated, slightly lobulated lesion in the intertrochanteric region of the femur demonstrates uniformly hyperintense signal on fluid sensitive images and hypointense signal on T1 weighted image. 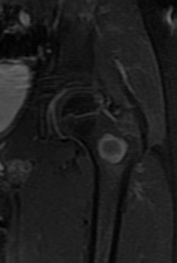 Peripheral rim enhancement along the edge of the lesion is present. Other differential considerations for lucent lesions in the proximal femur in a young patient include infection and fibrous dysplasia.